Please click below to visit our Kickstarter project page to pre-order a production model! Have you ever wanted to solder outside on a nice sunny day, but your extension cord was too short? Now you can with this small but powerful portable solar soldering station! Pack it up in a small bag or toolbox and you'll be soldering on-the-go in no time! It solders no problem up to 24 gage wire, but results may vary with thicker wire. Power Core manages the solar energy automatically so all you need to do is plug in Solarpad to Power Core. Do Not connect Solarpad directly to a USB soldering iron or any other USB device besides Power Core. Solarpad outputs up to 6 Volts of raw unregulated solar power that may not be compatible with other USB devices. Only connect Solarpad to Power Core. Once you connect the USB soldering iron to Power Core, push the power button on the soldering iron to activate! I find that it does take a few minutes to reach the proper temperature and it can cool down if you clean the tip on a wet sponge for too long. The sharp soldering tip is perfect for small hard to reach spaces. You can either keep Solarpad connected or disconnect it and use Power Core to power the soldering iron by itself. I found that the only way to turn the soldering iron off is to unplug it, because the power button only seems to turn it on, but not off. When I first got my USB soldering iron, I was skeptical of its performance, but after seeing it actually work, I am now a true believer! I even use it indoors when my fat tipped wall socket soldering iron just won't fit in tight spots. I just put the Power Core in my pocket, plug in the USB soldering iron, and finish the job! Update 2/15/2014: Though I had great results this last year, this USB soldering iron seems to have worn out over time and stopped working. It's only pulling 35mA now and it should be pulling 800mA. It could be due to a low quality circuit inside. I ordered a new and different USB soldering iron and I will let you know the results in a few weeks. It's an Instructable for a USB soldering iron retrofit and it seems to be more reliable than anything else on the market. I'll be making one too. Attached are photos of the modification I did to the Weller soldering iron with the USB cable coming out the bottom edge with a knot in the cable for a strain relief. I also used some Kapton tape to hold the wires down when putting the enclosure back on because sometimes the wire got caught in between. I measured 1.4 Amps going through the soldering iron. I think the reason why this soldering iron is more stable is because it uses simple springs to complete the circuit and doesn't use cheap fragile PCB components. It would be good to add some weight to the end of the soldering iron so that it could rest on the base. Right now it's so light that when the soldering iron is placed on the table, the USB cable can drag it down. Maybe in the future I could find a way to epoxy some weights inside the end cap. 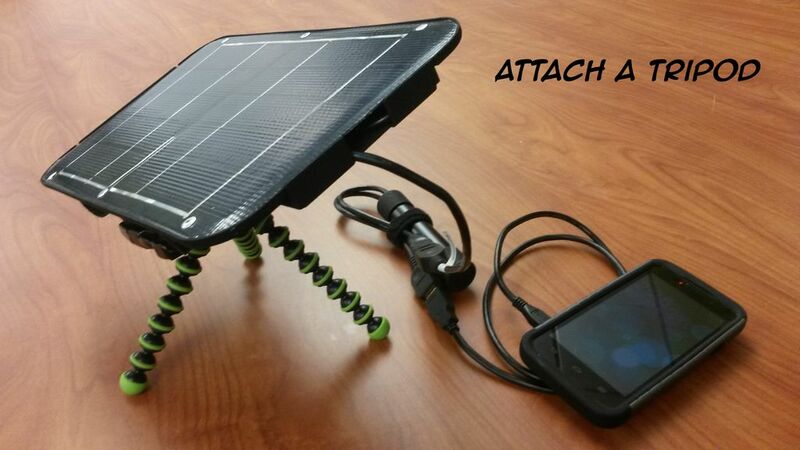 Step 3: Add a Tripod, Charge a Phone, or Pack It Away! Solarpad is tripod compatible with a 1/4-20 thread on the back so you can aim it at the sun better. Once you're done soldering you can unplug the soldering iron and charge your phone! Once your done with everything, you can easily store it in a bag or backpack! I am amazed that a soldering iron could be powered by a solar cell.